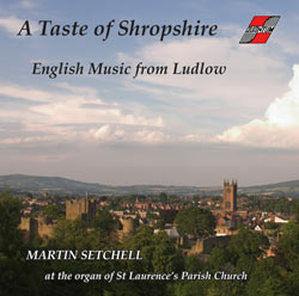 To find out more or buy the CDs, click on the BUY NOW buttons below the images. They will take you to our pipelinepress.com website where you will see the prices and the shipping charges before making your purchase on the secure PayPal site. * Original recording September 1997, from Let the pealing organ blow! (MANU 1539). By kind permisison of Ode Records​. Or you can buy also from Amazon! ​"This was the opening track of my first CD on the Rieger when it was installed in 1997. It is included here to ‘link hands’ with the past as the ‘pealing organ blows’ again and begins a new chapter in its life." The Christchurch Transitional Cathedral, more commonly known as the Cardboard Cathedral, was built in 2013 in response to the need for a temporary building when the original Anglican Cathedral in Cathedral Square was badly damaged in a series of devastating earthquakes from 2010 to 2012. Designed by the Japanese architect Shigeru Ban, it is built mostly of cardboard tubes, timber and structural steel, with a concrete floor. Shipping containers provide side offices. The north-end triangular window design includes 49 1.2 metre-tall panels and incorporates images from the ChristChurch Cathedral's original rose window. 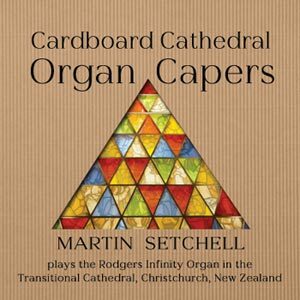 The Rodgers Infinity 484 digital organ was installed in 2013, and this is the first CD to be made on the organ of this series in New Zealand. A wonderful way to celebrate the rebuild of our beautiful Christchurch. ​Real artistry . . . it's fun listening to such splendid playing, meticulous and flawless . . .
Making a CD in a public space is a challenge that organists are all too familiar with; but trying to record sound tracks in what amounts to a gargantuan building site must be right up there with some of the most patience-demanding tasks ever. For a week beforehand we arrived at 5am in the so-called lull between night-work diggers, scrapers, lifters, loaders, crushers, concrete mixers, tractors heavy haulage vehicles and every other large mechanical beast known to man - and before the arrival of the morning's shift of day workers. A couple of hours each morning provided enough peace to lay down the 18 tracks. The complete recording with sound engineer Mike Clayton was a marathon session that lasted through the final night. The Cardboard Cathedral polycarbon roof with the timber-lined tubes is waterproof but not soundproof; in fact, not even enough to stifle the sound of people talking outside. 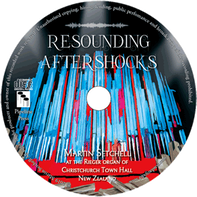 With a set of traffic lights on the One Way road system a mere dozen or so steps away from the front door of the cathedral, it was a matter of timing the recordings between light changes and the constant flow of vehicles all determinedly doing their bit for the rebuild of Christchurch. But it's still a happy thought that this CD is a small part of that rebuild ~ and indeed a very brave New World. Martin's earlier recordings, Let the Pealing Organ Blow! (MANU 1539), Bonbons for Organ 1 (Atoll 600), and Bonbons for Organ 2 (Atoll 603) and Pink and White (New Zealand Organ Music) and Great Australasian Organs VII (Priory) are out of print, sorry. “The last work in this pot-pourri is a pot-pourri in its own write (right). Magnificently entitled Introduction & Grand Concert Variations on a Hymn Tune by Sir Arthur Sullivan (the not-so-young-person's guide to the organ) it lasts a good 16 minutes. It is a sweeping up of a gross of different styles and a dozen quotes from famous organ and orchestral works. Too many to itemise – but look out for Widor – you cannot really miss him. Just the sort of piece to bring the house down . . . The celebrated New Zealand organist Martin Setchell plays superbly throughout; he is an impeccable stylist, with nimble fingers (and feet) and is clearly having a jolly good time as well. This enjoyable disc – something for that Sullivan collector who already has everything else. Robin Gordon-Powell, for Sir Arthur Sullivan Society magazine.